The two coordinators dispatched from AMDA Headquarters arrived at Asahikawa Airport at 3pm on 7 September, then travelled to Sapporo by car. The next morning, the team was joined by a doctor who worked with AMDA during the Kumamoto earthquake disaster (April 2016) and joined a meeting at the Disaster Management Headquarters at the Hokkaido prefectural government. 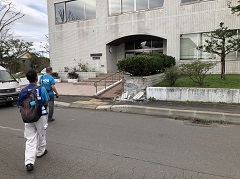 Afterwards, they went to Tomakomai City to collect medical information, and then conducted a needs assessment in Atsuma Town, which was reported to have been damaged the most is this disaster. 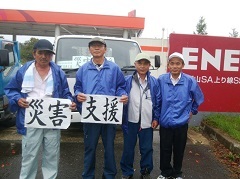 Additionally, the AMDA Support Farmers Group*, who have regularly supplied disaster victims with food, departed Okayama for Hokkaido by car with food supplies on 7th September. In response to this recent disaster, they intend to cook food for those affected who do not have access to decent meals. The group entered Sapporo, Hokkaido the next day, and joined the AMDA team on 9th September. According to information from the chief of the Crisis Management Section of the Hokkaido General Affairs Department, 21 people have been killed, 8 people’s fates are unknown, and there are 5,628 evacuees living in 264 evacuation centers. Blackouts and water outages are still continuing throughout Hokkaido. In terms of transportation, airports are reopening, and regular trains have started running again in some areas. *The AMDA Support Farmers Group consists mainly of individual farmers who provide food for disaster victims and support agricultural schools. Presently, there are roughly 50 members. They have been conducting activities such as sending rice to an NPO in Sendai City.